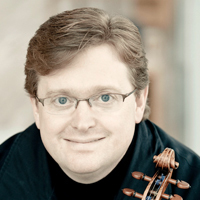 Martin Beaver, first violinist of the renowned Tokyo String Quartet from 2002-13, remains one of Canada’s violin ambassadors to the international concert stages and is an active musician for recital, concerto, and chamber performances. He has been a concerto artist with orchestras around the world, including all the major Canadian orchestras, and has collaborated with Pinchas Zukerman, Raymond Leppard, Leon Fleisher, and Yannick Nézet-Séguin. He is a founding member of the Montrose Trio with pianist Jon Kimura Parker and cellist Clive Greensmith. A former pupil of Victor Danchenko, Josef Gingold, and Henryk Szeryng, he has served on the faculties of the Peabody Conservatory and the Yale School of Music and is currently professor of violin and chamber music at the Colburn School.